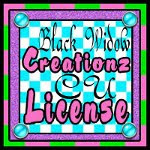 My friend, Crys from Creative Scraps by Crys and I have started up a blog train that will be taking off mid-month. It is called Scrappin' Your ♥ Out! There will be a lot of goodies, both commercial use and personal use! There is still room for more designers! If you'd like to take part in this blog train, please let me or Crys know before the 10th... You can join the Yahoo group as well as the Facebook group if you want to be a designer. The theme for March is Elegant Spring with the color palette below.